First of all, some basic terminology. In the picture on the left, (1) is the primer, which is hit by the firing pin, when one pulls the trigger. 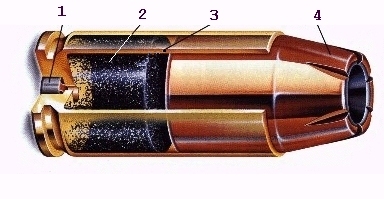 The primer produces a flame, which ignites the powder (2), inside the cartridge shell (3). The burning powder produces huge amount of expanding gazes, which push the bullet (4), away from the cartridge shell, down the barrel and towards the target. There are several different types of these components. For example, there are at least two different kind of primers (small and large pistol primers), several hundrend different kinds of powder, and several kinds of bullet design. Here are some of the most well known. Of course, some manufacturers are producing bullets, which are somewhat different than the above, and are known with proprietary names. For example, Winchester's Silvertip or Winchester's Expanding Point Bullet, shown below. Last edited by John; 14th October 2005 at 13:58.